Navigating the massive Western New York campus was a burden to patients, but its CIO tailored a mapping system to improve their experience. Kaleida Health is one of the largest healthcare providers in Western New York, with a massive campus that demands patients spend a significant amount of time and effort to navigate the sprawl just to find appointments. With that in mind, Kaleida Health Chief Information Officer Cletis Earle said the system partnered with outside vendors to tackle the patient experience as much as possible. The solution? An IoT wayfinding tool. Once the user crosses into Kaleida’s campus, an internal map displays the best route to get to the right building -- down to the best parking area, Earle explained. Much like when using Google Maps on public roads, the wayfinding app marks the patient’s location with a blue dot. The tool even shows patients amenities, such as nearby coffee shops. 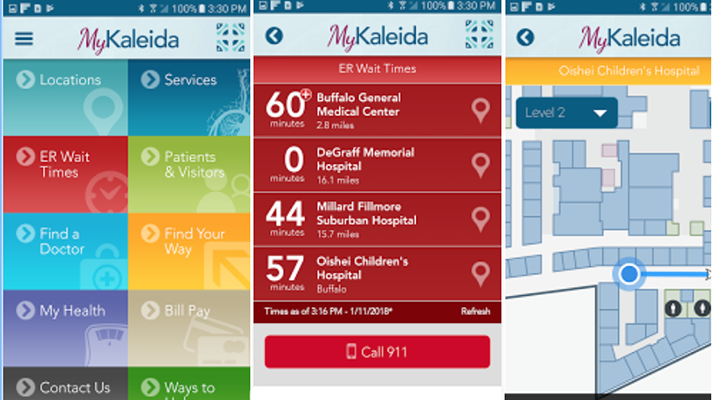 Launched in the spring of last year, Kaleida is rolling out the app at other locations, including the health system’s four hospitals. But while the tool started as a way to help patients find their way on the massive campus, Earle said Kaleida wanted to take it a step further and integrate the tool into the EMR. The idea was to allow patients to easily connect to their health information, to schedule visits and receive reminders about upcoming appointments. The app can tell a patient how long it takes to get to the office, explained Earle. Wayfinding also improves patient experience by providing infotainment in the hospital. While rooms have regular televisions, the app can also be used for education and customer feedback. One unintended result was that staff used it, too, as a way to figure out the new facility, said Earle. Kaleida’s new children’s hospital opened in Nov. 2017. For those hospitals considering a wayfinding tool, Earle said it’s important that the project is not simply an IT-owned initiative. So Earle recommended IT teams remain engaged with all sites and the changes that occur, to see what the tool is accomplishing in all areas. Kaleida, in fact, is using its wayfinding app as a framework for other exciting things, explained. The health system has a few more projects planned to improve patient and clinical experience, as well, Earle said. Earle and CDW Business Architect David Frumkin will be discussing the wayfinding project at HIMSS18 at 1 p.m. March 7 in Las Vegas at the Venetian Convention Center, Palazzo E.